The Philco 211 at UW, I recall was in the Commerce (Business) building just east of the Coe library. 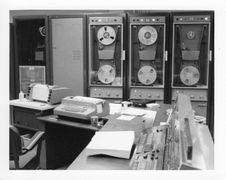 Computer users submitted programs on IBM punch cards to be run in batch mode by closed-shop computer center operators. The photos here were taken in 1970 when the center was opened up for a public tour, I think as part of the Philco decommission. I ported the 3D tic-tac-toe program to the Philco 211 during my first graduate semester in 1968, writing it in assembly (TAC) to learn some of the machine's instruction set. After getting the program running and obtaining some monitored access to try it out (it used the operator's console in real time), there was no point in continued use. Fortunately I found plenty of physics related computer work in the microwave spectroscopy lab. 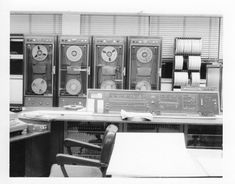 Later in 1973, working as a junior systems engineer on an Air Force contract to replace an aging satellite tracking and cataloging system (SPADATS) with a Honeywell 6080 based Space Computational Center in the Cheyenne Mountain Complex (with NORAD), Colorado Springs, I was surprised to discover that the SPADATS system ran on a Philco 212, and that some of the orbital mechanics software was developed on a Philco 211. An interesting unit in the center was a magnetic storage drum. I remember people working on it and getting an explanation of how it functioned, but don't know if it was ever made operational. Technical manuals for the Philco 2000 series can be found archived online. 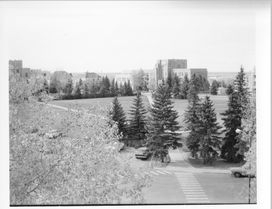 These two photos were taken in late summer of 1968 by a staff member of the Physics Department, then under Dr. Derek Prowse. Prints were given out to interested grad students - I was a new arrival, and so took some notes about the buildings in the views. 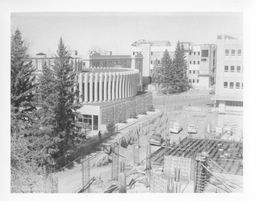 When I arrived at UW as a physics grad student in fall of 1968, equipment for the physics labs was being moved from the Engineering building into the newly completed Physical Sciences building, shown here in a photo taken from Old Main. In the foreground are the to-be Library Annex and Biological Sciences building. 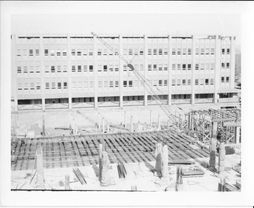 To right, another photo taken from Old Main, showing the almost completed round Classroom building and old Chemistry building behind it, new Pharmacy building in middle background, and the pit in foreground about where the planetarium would be. 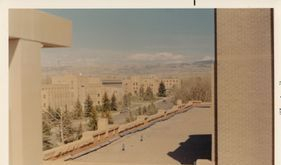 Views from the Physical Sciences building roof, 1970. The prints have gotten a bit faded by 2017. 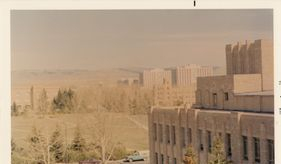 << View towards Engineering building from Wyoming Union roof, 1968. New Physical Sciences building roof just visible at left. 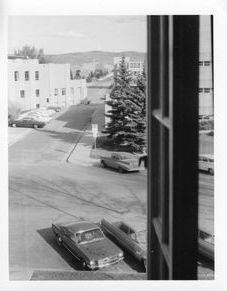 >> View east past Wyoming Union from Knight Hall, NE third floor corner room, 1968, where I spent my first year. Pilot Hill is on skyline. 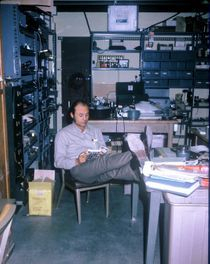 The Microwave Spectroscopy Lab was in the lowest level of the Physical Sciences building, in the southwest corner of the interior block of offices and labs (i.e., if it were on an upper floor, it wouldn't have windows). It was a long lab, having two double-door entrances to the east-west hallway. 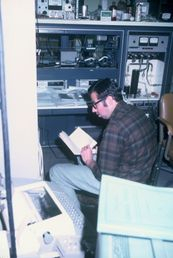 The lab had two major pieces of equipment: an HP RE05 8400-B Molecular Rotational Resonance Microwave [gas] Spectrometer, and a DEC PDP 8/I Digital Computer. They were both purchased with NASA grants obtained by the creator and master of the lab, Dr. Edgar A. Rinehart. Dr. Rinehart was very encouraging and hands-off if you knew what you were doing and/or were willing to learn. As you can see from the photo, he was also extraordinarily tolerant. 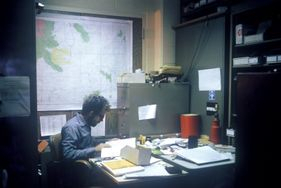 Starting my second graduate semester, I was advised by a faculty member, knowing of my interest in computers (a seeming rarity among physics folks at the time) that Dr. Rinehart was looking for someone to hook his spectrometer and computer together. With an electronics hobby background, and having made some simple hardware modifications to an IBM 1620 in college, it sounded very interesting to me. Dr. Rinehart took me on for the task and became my degree advisor. After getting acquainted with how the spectrometer functioned and the ways it was used, the interfacing task was lengthy but mostly straightforward. 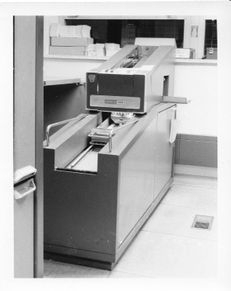 The HP spectrometer was primarily analog, but was meant to be easily controlled and monitored with voltage control-inputs & readouts, and had some automated functions. (The most complicated interface was to design & implement a stepper-motor control with range limits and malfunction detection to drive four front panel rotary switches on a pressure gauge.) The PDP8-I (a 12 bit mini computer fit into the lower half of a full height equipment rack) was designed for interfacing, which DEC encouraged with a line of low level digital logic boards and wire-wrap backplane modules. It was here that I discovered the simplicity of wire wrapping digital logic that I would later use on the Other-1. Three grad students, Ramesh Kakar, Marty MacDonald, and myself, and an undergrad student (whose name I can't remember) had small office spaces in the lab. My space was comparatively large, the wall being one of the double-door entrances. It's downside was that the maintenance folks occasionally tested their ability to gain entry that way. When I started working in the lab, Ramesh was wrapping up his Ph.D. work, and so was nearly always holed up in his lab office. << Marty was startled very easily, so this expression was common. 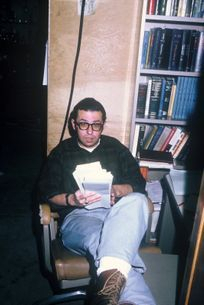 On the first floor directly above the Spectroscopy lab, there were three contiguous labs with friendly graduate student neighbors: the first occupied by Larry Sims, then the Transport Phenomena lab with Nikiforos (Nik) Kollias, and then the Low Temperature Lab with Monte Giles and Terry Scott, all well on their way to Ph.D's. 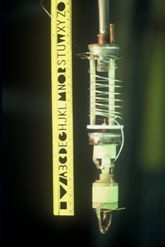 << Nik studied electron conduction shell geometry in lead crystal at low temperature - using liquid helium pump and large electromagnet. 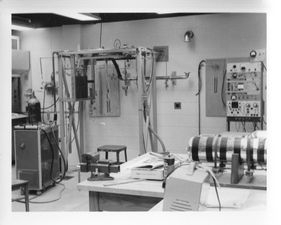 In fall 1970, one of these labs was instrumented with Dewars that needed to be lowered to allow access to a stationary experiment being cooled. 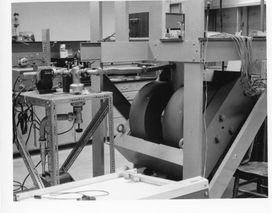 A large hole was drilled into the concrete floor, and through the ceiling of the Microwave Spectroscopy lab behind the Spectrometer to provide for this. Near to my last day at UW (I had succumbed to military draft, but with Physics M.S. ), I went up to take photos of these folks, but Larry and Nik were out. << Monte Giles and Terry Scott offered to stand in for the absent Nik Kollias for this photo in the Transport Phenomena lab. 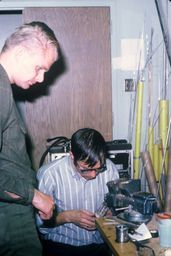 >> Monte and Terry in their own Low Temperature lab, preparing an experiment, shown in closeup, far right.